MONTREAL (AP) — Viewed from the outside, Quebec often seems like a place where all life orbits around the political destiny of a French-speaking province in an English-speaking country. The latest instance centers on religious headwear. The trigger is a heatedly debated plan by the ruling party, the separatist Parti Quebecois, to make the provincial government religion-neutral. It wants to do so by banning symbols of religious faith such as Jewish skullcaps, Sikh turbans, Muslim head scarves and large crucifixes from public work places. And as usual, the measure is being read also for what it says about the ruling party's perennial goal of making Quebec independent of the rest of Canada. The analysis is that with support for separatism weakened, and an election being predicted for December, something spectacular is needed to rally the party base. But the proposal appears to be losing support with that base, and if anyone is being mobilized, it's the opposition. In recent weeks Montreal has witnessed the rare spectacle of thousands of protesting Muslims, Jews and Sikhs marching together through the streets. 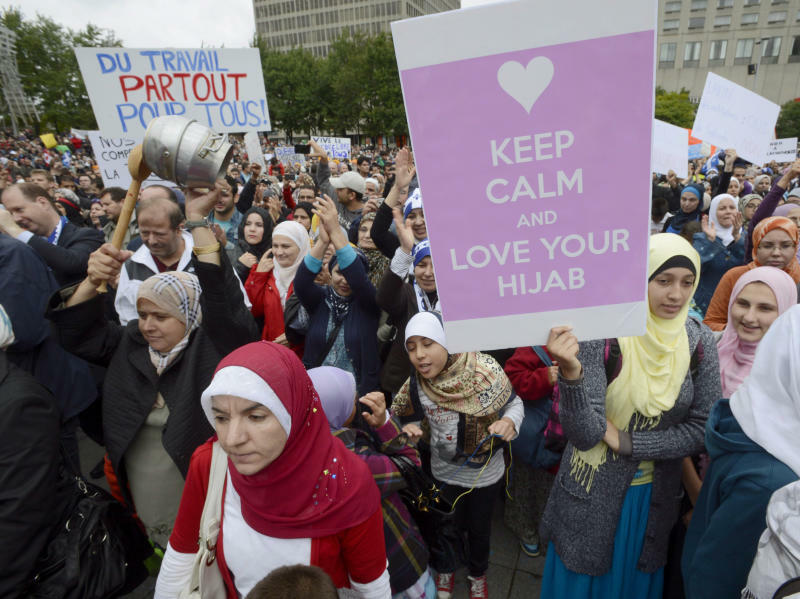 "I just want to be able to wear what I want; I don't see why anyone can tell me what to put on my head," Saara Khan, a Montreal Muslim high schooler who wears a head scarf, said at a recent protest. 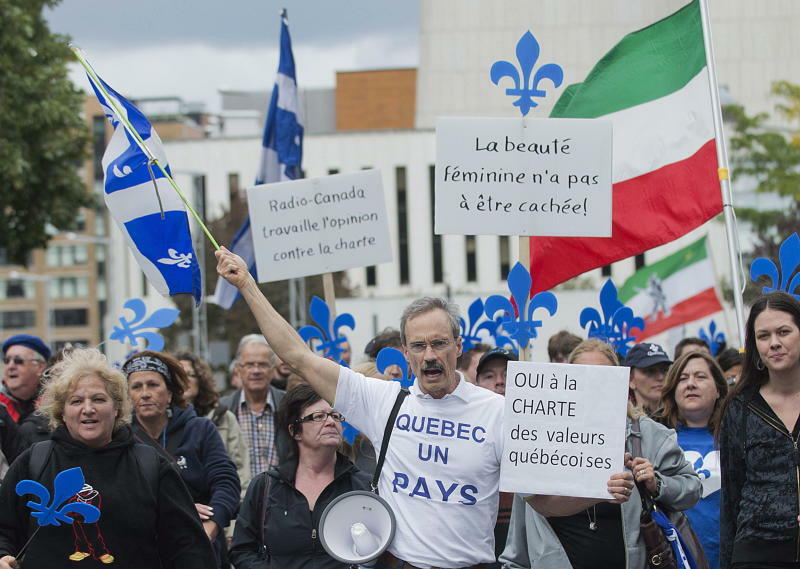 The proposed ban, part of what the Quebec government calls its "charter of values," has divided the province of 8.1 million though polls show it holds more support among French-speakers. The Parti Quebecois is a minority government and will need opposition votes to pass the charter, which won't happen without it being softened considerably. Montreal, a mix of classic North American skyscrapers and the charm and style of a French city, has added a new layer of personality over the past decade with an influx of Muslim immigrants from North Africa. But critics say the government is promoting the charter to play on fears of religious minorities, particularly among rural voters who rarely have immigrants for neighbors. The Parti Quebecois also is once again sounding the warning that the French language is under threat and needs a boost lest it become "anglicized." The ban on religious headwear, the most disputed element of the proposed charter, would apply to anyone working in public institutions, including day care workers, doctors, nurses, teachers and police officers. When announcing the plan in early September, the PQ used cartoon graphics to show what would and wouldn't be permitted. Inconspicuous necklaces and earrings would be fine. 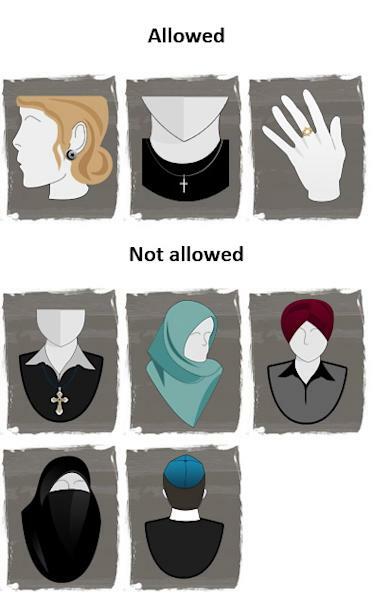 But skullcaps, turbans, head scarves, veils and any prominent religious symbol would be banned. Introducing the charter, Bernard Drainville, the minister responsible, said the new rules would help unify society, ensuring the state's neutrality and gender equality. "In a society that's more and more multicultural, there need to be common rules and values," Drainville said. How would the rules be enforced? By "common sense," he replied. France has been pointed to as an inspiration, with its banning of the face-covering burqa and religious symbols in state schools. Elsewhere in Canada, reactions have been fierce. The federal Conservative government says it will fight the change in court. The Ontario legislature has passed a motion of condemnation, and Naheed Nenshi, the Muslim mayor of Calgary, has invited religious minorities to move to his city where "we don't care how you worship." Several former Quebec premiers have spoken out against their party's intentions. One of them, Jacques Parizeau, recently wrote in Le Journal de Montreal that the plan stems from fear of Islam, because "About the only contact most Quebecers have with the Islamic world is through images of violence..."
Akli Ourdja, part of a North African group that supports the charter, cites the example of his native Algeria and the suffering inflicted there by the mixing of religion and politics. "What I find discouraging is the intellectuals and the media who are trying to say the charter is against immigrants," he told The Associated Press. "On the contrary, this will allow us to live together more harmoniously." But some of the strongest criticism comes from representatives of the religions. Quebec's leading Catholic bishop, Msgr. Pierre-Andre Fournier, has suggested the effort could create cultural "ghettos." "Women will stay at home and will not integrate, and neither will their children," he said at a news conference. David Ouellette, associate director of Quebec's Centre for Israel and Jewish Affairs, said the proposal has left Jews hurt and worried. "The neutrality of the state is already firmly entrenched," he told AP. "The government is unable to explain on what basis it proposes to impose such severe restrictions on freedoms and rights." Some worry the ban would force them to choose between their religion and their job. Some employers are also concerned. Hospitals are seeking a permanent exemption on the grounds the measure would create tensions and drive away talent. Michel Lincourt, who heads an association of Quebec secularists, defends the proposal and wants it to go further by removing the crucifix from the legislature. "This is for our future," he said to AP. "If we want everyone to be treated the same way, regardless of their religion, their beliefs, or where they are from, then secularism is what allows this to happen." Meanwhile, the extent of the ban remains uncertain, with special attention focusing on the large crucifix hanging in the provincial legislature. When the ban was first proposed, Drainville insisted that "The crucifix is there to stay, in the name of history, in the name of heritage." But on Wednesday the Montreal daily La Presse reported that the government was considering removing it. Drainville declined to confirm or deny it to reporters, saying the final proposal was not complete.